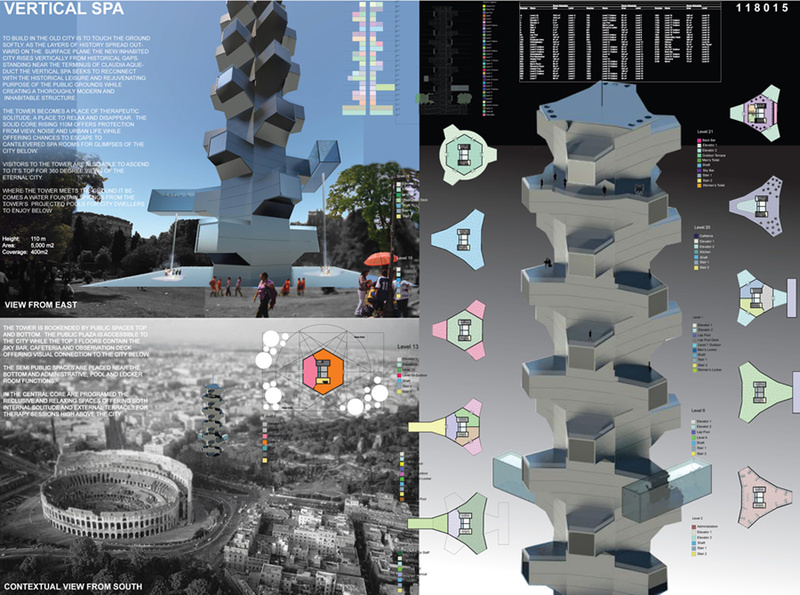 2010 Competition entry sponsored by Arquitectum and Istituto Nazionale di Architettura for a vertical spa complex among the ruins of the old city in central Rome directly across the street from the coliseum. The competition is meant to ask what is the proper way to approach historic city centers and do we treat them as museums or active parts of the city going forward? This proposal attempts to touch the ground lightly with a small footprint made possible by a vertical super core onto which hang spa rooms, or modules. The modules allow for intimate, unique experiences framing views of the old city below and offer on their rooftops many terraces for the floors above. The site is treated as a public fountain square in keeping with ancient Roman tradition of the fountain as gathering place. Among the entries to the competition totaling over 400 from around the world, common themes of vertical density, access to the outdoors and framed views where presented. Although set in Rome which is an extreme example the friction between preservation and progress, the competition themes are applicable to any city struggling to come to terms with it’s past and future building methods and how to reconcile the two.